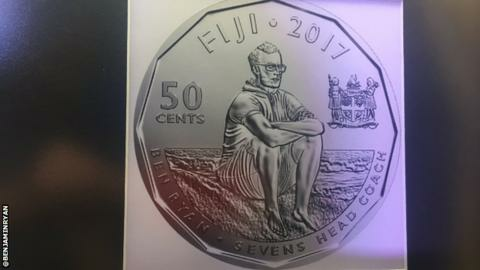 Olympic sevens winning coach Ben Ryan has been honoured with a commemorative 50 cent coin in Fiji. The Englishman, 45, led Fiji's rugby sevens side to gold with a 43-7 win over Great Britain in the final at the Rio Olympics last August. He tweeted a picture of himself on the coin with the message: "Fiji's new 50c coin - what a journey I've had." Ryan was also given three acres of land in Fiji after helping the Pacific nation win their first Olympic medal. In addition he was awarded the Companion of the Order of Fiji, the highest honour in the country. Ryan coached England's sevens side from 2007 to 2013 and joined the Welsh Rugby Union as a consultant in January.